Whimsical Ideas by Pam - The Hallowhimsy Collection 2016 - Polish Etc. It's the most fun month of the year...October. Why? Because it's time for Halloween which is the most fun holiday of the year. At least in my opinion it is. What is more fun than dressing up in costumes and scaring people. And you can wear orange the entire month which is a bonus for me. 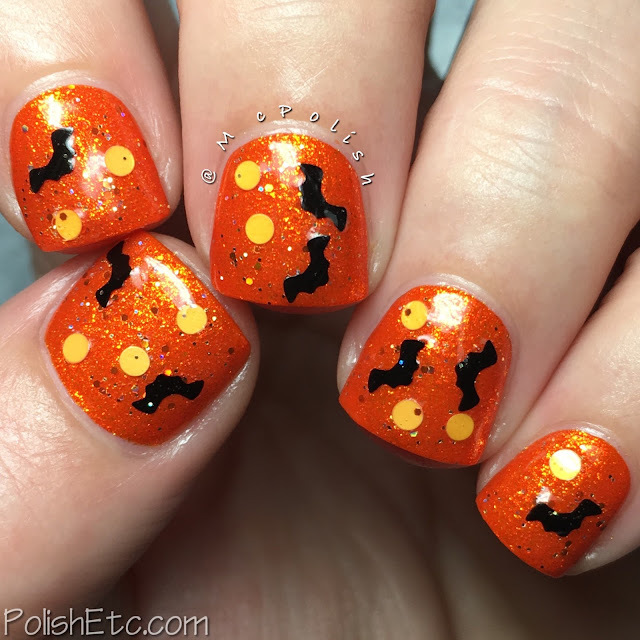 I love orange :) Every year, Pam puts out a super fun Halloween collection and this year is no different. There are 7 Halloween and fall theme polishes in the Hallowhimsy collection that are sure to be crowd pleasers. Let's take a look at them all! A Variety of Moss - A sage green creme packed with gold and minty green microflakies. I really like this shade of green. It is soft but the shimmer really makes it pop. The formula was easy but slightly sheer. I am showing you three coats with a glossy top coat here. Mostly Ghostly - A slightly grayed out white creme. Oh...I love this. It reminds me of my fave white, OPI My Boyfriend Scales Walls. It is white but there is a touch of grey in here that gives it a ghostly glow. The formula of this was a little squishy, too. I needed three thin coats for full opacity and topped it with a glossy top coat. Dark and Stormy Night - A clear based glitter topper with matte black and sapphire blue metallic hexes. The blue glitters in here really glow in person, they are gorgeous. I used one coat over Mostly Ghostly and topped it off with a glossy top coat. Gobble Gobble - A clear based glitter topper packed with metallic caramel and garnet glitters in various sizes. 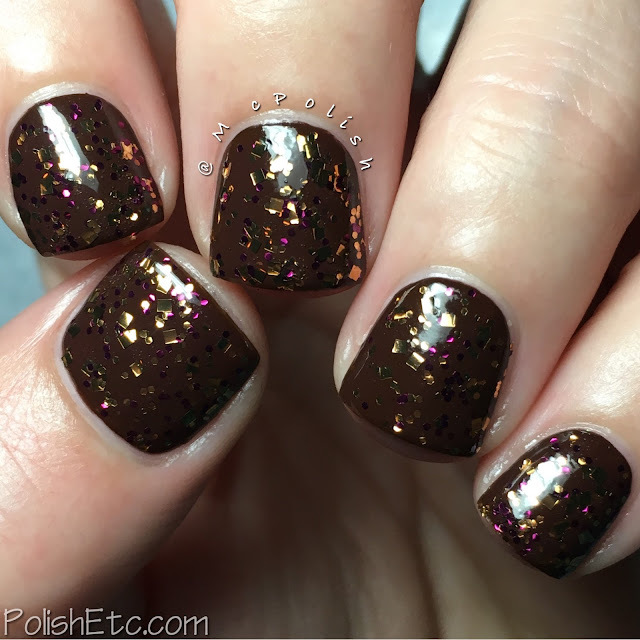 This is a great fall glitter! I am showing you one coat over Zoya "Louise" with a glossy top coat. Taffeta, Darling - A bright orange jelly jam packed with golden shimmer. Yep...I'm in love. 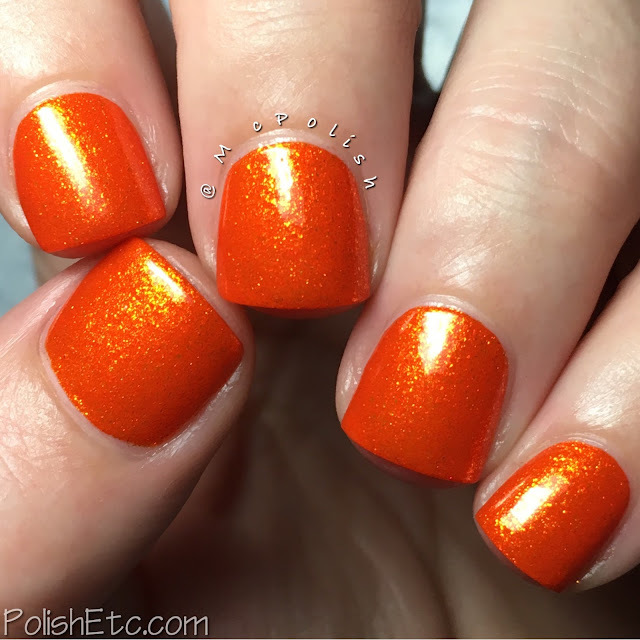 Orange polish with gold shimmer just never gets old and this one is a stunner! The shimmer is intense. 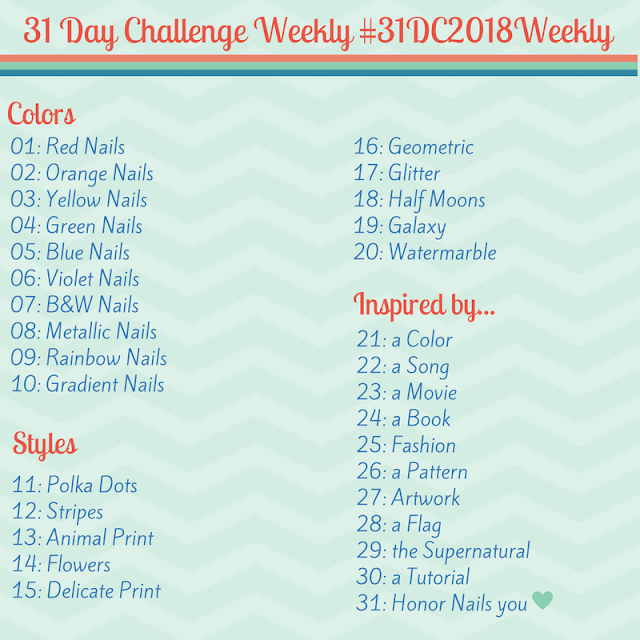 I am showing you three thin coats with a glossy top coat here. 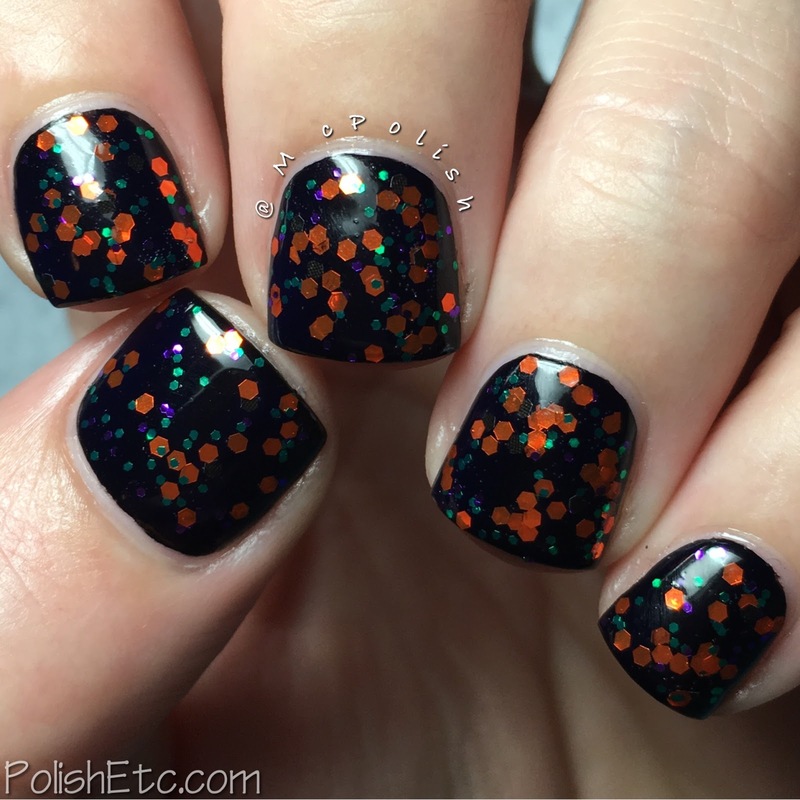 Bat-chelor in Paradise - A clear based topper with medium light orange matte circles, matte black bat glitters and orange and black microglitter. This is a Halloween glitter for sure. You wouldn't really wear this at other times during the year, so if you want this for the holiday be sure to pick up now. I used one coat dabbed over Taffeta, Darling. The glitters came out of the bottle well but they do need manipulation to get them where you want them. Witch and Famous - A clear based glitter topper with bright metallic hexes in orange, purple, green and black. 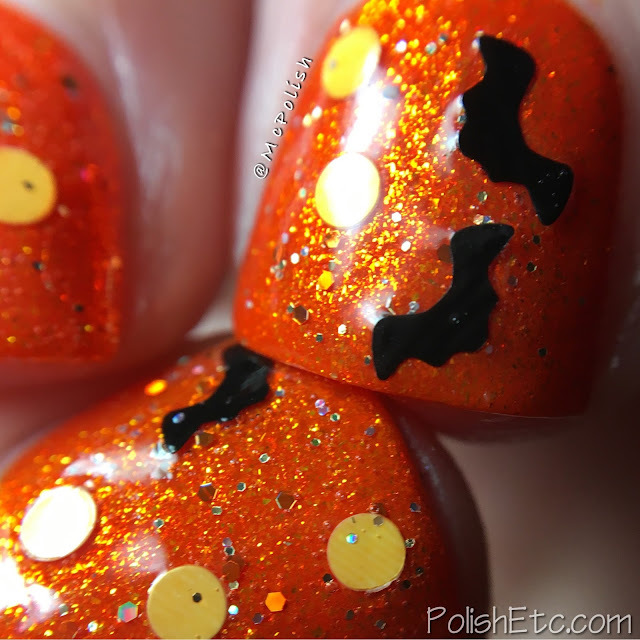 This is a perfect Halloween glitter topper as well! The colors are exactly what you think of for the holiday. I used one coat over a Cult Nails "Nevermore" with a glossy top coat for this swatch. 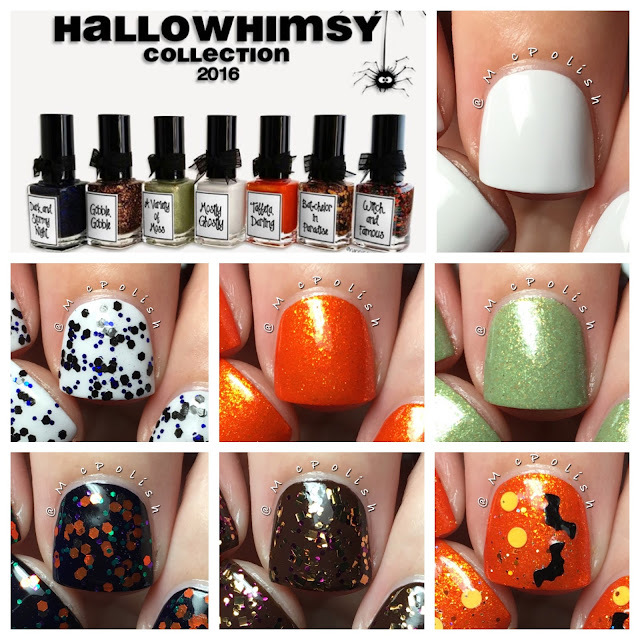 The Hallowhimsy Collection 2016 is available now for purchase. All of these polishes are purchased via email. Head over to the Whimsical Ideas by Pam Facebook page for all of the ordering details. All polishes are $10 a bottle and rarely run out of stock. My faves are Mostly Ghostly and Taffeta, Darling. Which will you be picking up?